A VIEWING IS ESSENTIAL IN ORDER TO FULLY APPRECIATE THIS FANTASTIC 5 BEDROOM SEMI DETACHED FAMILY HOME SITUATED ON RED HALL DRIVE, COCHRANE PARK. This beautifully presented and tastefully extended property is conveniently situated for access to the Coast and Newcastle City Centre as well as a whole host of other local amenities. The exceptionally generous accommodation comprises: entrance hall, lounge, dining room, sun room, dining kitchen and utility room. 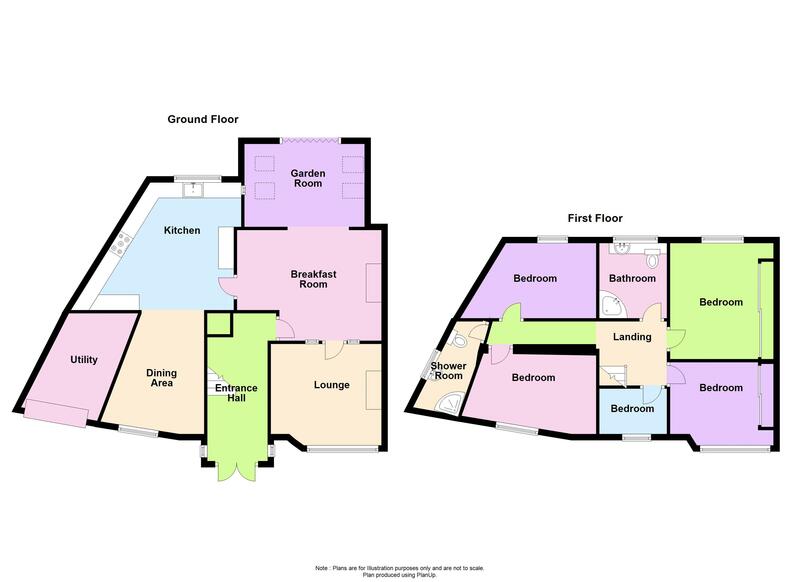 To the first floor there are 5 bedrooms, a family bathroom/wc and a seperate shower room/wc. Externally there are gardens to the front and rear and a driveway to the front. Fitted with a range of solid wood wall and base units, Granite work surfaces, 1 ½ bowl sink unit, integrated fridge, integrated washing machine, integrated dishwasher, built in Bosch double electric oven, built in hob, extractor hood, solid walnut flooring, understairs cupboard, coving to ceiling, part tiled walls, telephone point, television point, skylight, LED spotlights and double glazed windows to the front and rear. Double glazed bay window to the front, marble fireplace with fitted gas fire, solid walnut flooring, alcoves, telephone point, television point, coving to ceiling and a double radiator. Fitted gas fire, alcoves, solid walnut flooring, telephone point, television point, coving to ceiling, radiator and an archway leading to the sun room. Double glazed entrance door, double glazed window to the side, solid walnut flooring, staircase to the 1st floor, coving to the ceiling and radiator. Double glazed bay window to the front, fitted wardrobes with mirror fronted sliding doors, television point, carpet, coving to the ceiling and radiator. Double glazed window to the rear, fitted wardrobes, television point, carpet, television point, coving to ceiling and radiator. Double glazed window to the front, access to roof space, carpet, coving to celling and radiator. Double glazed window to the front, carpet and radiator. Double glazed window to the rear, carpet and radiator. Low level wc, wash hand basin, step in shower cubicle, heated towel rail and a double glazed frosted window to the side. White 3 piece suite comprising a corner bath, wash hand basin and low level wc. Tiled walls, tiled floor, mirrored heated towel rail and a double glazed frosted window to the rear. Mainly laid to Astroturf with a garden shed, paved area and driveway. Mainly paved, Astroturfed seating area and fenced boundaries.